Allison Maria Rodriguez is a first-generation Cuban-American interdisciplinary artist working predominately in video installation and new media. She creates immersive experiential spaces that challenge conventional ways of knowing and understanding the world. 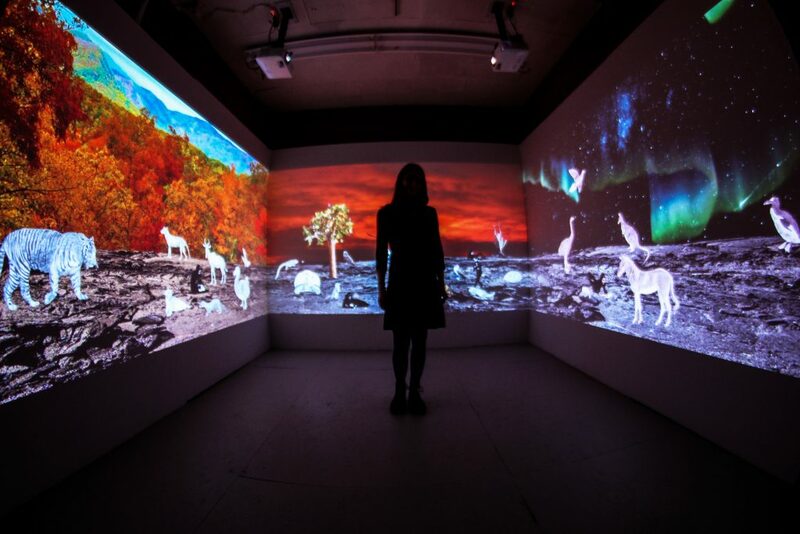 Her work focuses extensively on climate change, species extinction and the interconnectivity of existence. Through video, performance, digital animation, photography, drawing, collage and installation, Rodriguez merges and blends mediums to create new pictorial spaces for aesthetic, emotional and conceptual exploration. She uses art to communicate beyond language – to open up a space of possibility for the viewer to encounter alternative ways of connecting to the emotional realities of others. Rodriguez’s work has been exhibited internationally, throughout the country and extensively in the New England area, in both traditional and non-traditional art spaces. In 2018 she had solo exhibitions at the Boston Children’s Museum and the Dorchester Art Project. Her most recent projects include several large-scale public art video installations commissioned by Boston Cyberarts and the Massachusetts Convention Center Authority. Her work has recently been supported by grants from The CreateWell Fund, the Boston Cultural Council, the Arlington Cultural Council, The Archie D. & Bertha H. Walker Foundation and Assets for Artists. Rodriguez is the grand prize winner of the 2017 Creative Climate Awards sponsored by The Human Impacts Institute for her video installation “Wish You Were Here: Greetings from the Galápagos”. She was also recently awarded a 2018 Earthwatch Communications Fellowship for a residency at the Churchill Northern Studies Centre to work on their “Climate Change at the Arctic’s Edge” project. In 2019 she was honored by WBUR’s The ARTery as one of “The ARTery 25”, a celebration of 25 millennials of color impacting Boston’s arts and culture scene. Rodriguez received her MFA from Tufts University/The School of the Museum of Fine Arts and holds a BA in Language, Literature and Culture from Antioch College in OH, obtained also through study at Oxford University in England and Kyoto Seika University in Japan. She has taught courses in art theory and media production in a variety of contexts, from universities to children’s museums. She is also an independent curator and participates in artist collectives such as the CreateWell Collective Leadership Alumni Board, the Boston LGBTQIA Artists Alliance (BLAA) and the former Axiom Group. Rodriguez has been an Artist-in-Residence at The Studios at MASS MoCA at the Massachusetts Museum of Contemporary Art, Arts Letters & Numbers, The Wassaic Project, the Dorchester Art Project (inaugural resident), the Ragdale Foundation and the Churchill Northern Studies Centre. She is a core artist at Fountain Street Gallery in Boston and has her studio at the Boston Center for the Arts.